Dell Inc. said the company and its Chairman and CEO, Michael Dell, are in negotiations with the U.S. Securities and Exchange Commission to settle charges related to past dealings with chip-maker Intel. Dell revised its earnings statement for the past fiscal quarter to include a $100 million liability to cover the cost of an anticipated settlement by the company with SEC. 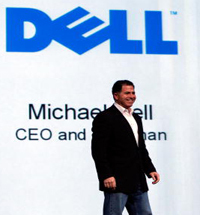 Michael Dell is negotiating with the SEC on a settlement framework regarding potential charges against him involving “alleged violations of negligence-based fraud provisions of the federal securities laws, as well as other non-fraud based provisions,” the company said. Any such settlement “would not include any bar against Mr. Dell’s service as an officer and director of a public company,” the company said, and would be made without admitting or denying the SEC’s allegations. In 2007, two Dell shareholders filed a class action lawsuit against the company alleging that senior executives had improperly accounted for hundreds of millions of dollars in payments from Intel and had used the payments to artificially inflate the price of the company’s stock. In 2009, New York State Attorney General Andrew Cuomo filed an anti-trust suit against Intel alleging that from February 2002 to January 2007, the chip-maker paid Dell approximately $6 billion in “rebates” in return for Dell’s agreement not to market any products from Advanced Micro Devices, Intel’s major competitor. In 2006, the suit charged, Intel paid Dell almost $2 billion in “rebates,” and in two quarters of that year, rebate payments exceeded Dell’s reported net income.